One of the great benefits of renewable energy produced by small scale wind generators, water generators and PV is that energy continues to be produced over a long period of time. There is no fuel tank to run dry, therefore where stand-alone battery installations need to operate unattended, a mechanism is required to prevent battery damage through overcharging. This is the primary role of the charge regulator. Charge regulators of all types monitor the state of battery charge by the accurate measurement of the battery terminal voltage. As a battery approaches fully charged, the voltage necessary to drive the charging current rises. When this reaches a level which indicates a fully charged battery, (usually 14.2V on a 12 volt system) the regulator will act, and remove the charging current from the battery. The regulator does this to prevent the system voltage from reaching levels that would be damaging to the batteries. Excessive voltage causes gassing of the electrolyte and heating of the plates. Different types of regulator are used with different charging sources. 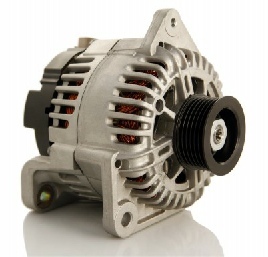 As in a car, a yacht’s main engine drives an alternator equipped with field coils. Field coils are copper windings which when fed with current produce a rotating electromagnet. This magnetic field is pulled thorough the alternator as one. The output of this alternator type can be increased or decreased by varying the current fed to the field coils, thereby strengthening or weakening the rotating magnetic field. However a different type of regulator is required for D400 and DuoGen. In common with most small wind turbines D400 and DuoGen alternators use permanent magnets in place of the field coils which characterise the automotive type. Therefore their output cannot be turned down. Where they are producing more power than is required, the surplus must be diverted away from the battery and dumped. For this reason wind turbine charge regulators are referred to as diversion or dump regulators. The charge is switched away from the batteries using either heavy duty relays or more commonly a solid state pulse width modulation circuit (PWM) or ‘chopper’ circuit as it also known. The diverted charge is connected to a large resistor where the surplus energy is lost as heat. This resistor also keeps the wind turbine ‘on load’ and moderates its rotor speed. If the turbine were simply disconnected from the battery, it would be open circuit, i.e. doing no work, and the air rotor would over speed. This is analogous to a car jumping out of gear, where the engine would race. Dump type regulators are available in a range of capacities (current ratings) and are usually voltage specific, as different dump load values are used for different voltages. Dump regulators are also used with water generators and can be used with hybrid PV systems. In some cases the heat produced at the dump load can be put to good use in pre-heating air or water. There are also dedicated solar regulators designed expressly for photovoltaic panels. As the PV panels have no moving parts they can simply be ‘switched off’ by the regulator, i.e. disconnected from the battery. This means that there is no need for a dump load. ge multiplied by the current delivers the maximum power output from the panel. The DC to DC converter then rebalances the voltage and current to provide an output optimised for battery charging. MPPT technology claims significant improvements in charging efficiency, and allows a charging current to flow to the batteries even when the panel voltage is lower than the battery terminal voltage. This condition occurs at dawn and dusk, and under heavy cloud. 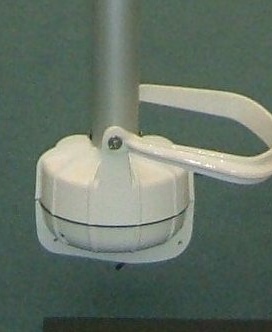 Maximum power point tracking is most highly developed for use with PV. However it also uses the potential to increase the overall efficiency of wind generators. There are very few proven MPPT enabled dump regulators currently available, although Eclectic does offer a sophisticated MPPT dump type controller with the StealthGen grid tied micro wind system. Battery charge regulators gauge the state of charge of a battery bank by reference to the voltage at the battery terminals. Most dump type regulators are wholly passive within the charging circuit. They do nothing until a pre-set trigger voltage is reached at which point they isolate the battery from the charging source. It is a common misconception that the regulator controls the charging voltage flowing in the circuit. It is actually the circuit load, (i.e. battery) that does that, up to the point where system voltages become too high, indicating full batteries. Note that a charging source always has to apply a voltage (analogous to pressure) which is higher than the battery terminal voltage in order to drive a charging current around the circuit. This fact explains the possibility of interaction where two or more charging sources and their regulators are connected in parallel to the same battery. If we assume a wind generator and PV panels, both with their own regulators, then one regulator can read the elevated voltage produced by the other, causing it to assume the batteries have reached a fully charged state. This may not be the case and the result is premature dumping of power. This interaction should not be overstated. It would only occur when the batteries are already well charged, and there is no risk of equipment being damaged. However interaction can be addressed in several ways if it is viewed as a problem. Using a single regulator for both wind and solar is one option. This removes the possibility of interaction but the regulator needs to have sufficient capacity to allow for the combined maximum outputs of both turbine and PV panels. An alternative is to fit separate regulators but equip them with by-pass switches. Then, if interaction occurs, the system operator can take a decision to switch out one or both regulators to ensure maximum power gets to the batteries. Note, the regulators should always be left switched back in where it is not possible to monitor the system continually and manually stop and start the system as required. Finally, many regulators are adjustable in terms of their dump trigger voltage. Where this is the case multiple regulators can be harmonised, i.e. all of the dump trigger voltages set to the same level. This should reduce the incidence of premature dumping. Dump loads are essentially large power resistors. They come in a variety of shapes and sizes. Most typical are the cylindrical ceramic types but flat plate resistors can also be used. Dump loads are characterised by their rating expressed in watts, plus their resistance expressed in ohms. Usually dump regulators are supplied complete with appropriate dump loads. Where these are sourced separately it is important to identify and use dump loads with the correct resistance and rating for your system. 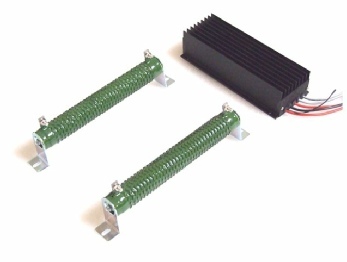 Dump resistors are essentially heating elements and they can get very hot in operation, therefore they should be mounted in a location where air is free to circulate and cool them. Also, it is preferable to keep the cable runs between regulator and dump loads as short as practical. Note that where a dump load is fed with current from a PWM type regulator, the pulsed current may produce an audible buzz or tinkling noise from the resistors. Most owners are glad to hear this noise as it means full batteries! This noise does not occur with relay type regulators. Rather than using air cooled resistors it is now possible to source low voltage immersion type heating elements. These can be installed in a water tank or calorifier which enables dumped power to pre-heat water.